Currently I am on my third trimester of pregnancy. Yes, I am expecting my second baby and it is truely a blessing to become mother, isn't it ? So dry skin, itching on belly area is very common during pregnancy and our body and skin go through lots of changes. Skin near belly area, breast, thigh area become itchy and got stretch marks and the months passed. So we definitely need something to relax or sooth down our skin of that particular areas and again to avoid stretch marks. So it is advisable to apply a good body oil or heavily moisturised body butter after entering the second trimester. I will must say, to consult your doctor before applying anything but I am writing this on my personal experience. 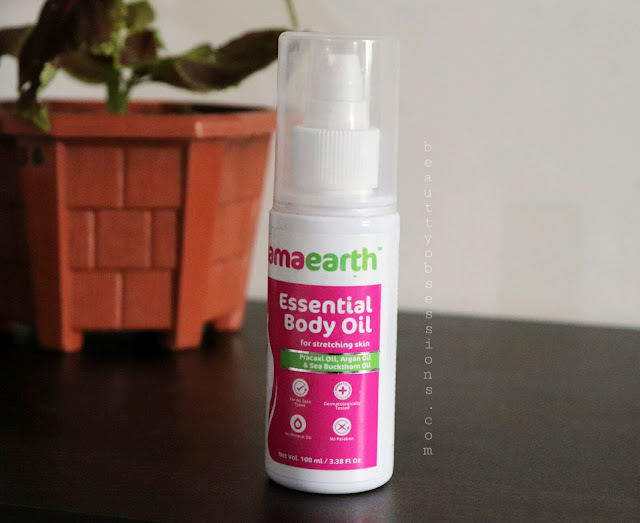 Well, currently I am using the Mamaearth essential body oil since I entered into my second trimester which is around 4 months back. Yes, I am using this since nearly 4 months now and the bottle is almost over now while I am writing this review. Should I buy another one or should I jump to any other product. . Find out the answer in the below lines.. So let's start the review..
Price - Rs499/- for 100ml. Ingredients - Almond oil, Olive oil, Mulberry Extract, Sea Buckthorn Oil, Jojoba Oil, Pracaxi Oil Complex, Rose Heep Seed Oil, Argan Oil, Green Tea Oil, Lavender Oil, Geranium Oil, Vitamin E .
Phthalate free, Mineral oil free, Paraben free, SLS free. Direction of use - Start applying from the second trimester to the stretch marks prone areas such as abdomen, lower back, hips and thighs. Apply on affected areas or skin twice daily in a circular motion. 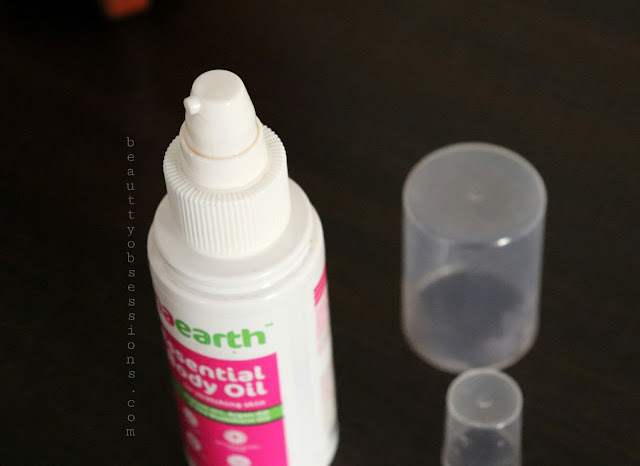 The MamaEarth essential body oil comes in a white bottle with a pump dispenser and two protecting caps over it. The pump packaging makes it very convenient to use. The two caps makes it more travel-friendly without any fear of leakage or spillage . The pump dispenses right quantity oil in each pump which is again good. All information regarding the product is on the bottle itself. Overall I like the packaging. I am using this body oil since nearly 4months now . Earlier I have never used any body oil and I was thinking like it will stain my cloths, I will feel sticky ,etc . But nothing happened like this. The oil is so light weight and absorbs into my thirsty skin quickly with a bit of massage. It doesn't feel sticky or greasy on skin. I need 3-4 pumps for my belly and back area, 2 pumps for my breast area and 2 pumps for thigh and lower abdomen area. I do apply this body oil everyday after my shower and even sometimes in between the day if I feel the dryness. It moisturises my skin properly during this winter too. Luckily I don't feel any kind of dryness and itchiness on my skin (specially on tummy skin). I can't say anything on controlling stretch marks because I have quite lot stretch marks from my first pregnancy only and these are still there.. To be very honest I am not applying this to remove my stretch marks or to control the upcoming stretch marks because I love my tummy stretch marks. It makes me feel proud that I am a mother. So my main moto was to control the dry feeling and itchiness on skin on which the body oil works great. The oil is of dark yellowish colour and smells like herbal kind. 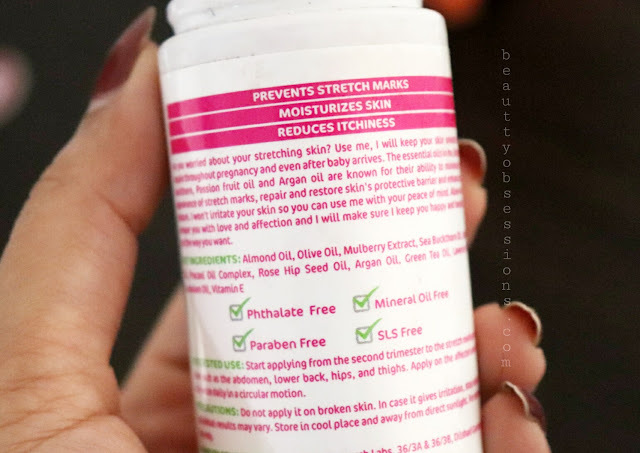 Look at the ingredients, it is blend of some many awesome oils like almond oil, argan oil, rose hip oil, etc. All these oil are really good for skin and beneficial too . It is phthalate free, paraben free and other harsh chemicals free which is very much amazing. I will suggest to everyone to use this, whether you are pregnant or not. It is best for skin. I will definitely gonna buy another bottle for me and will continue using this even after my delivery. Hope you liked this review and found it helpful. See you in another exciting post, till then stay hooked. . Already a fan of the masks. This body oil is perfect for marks etc. The details are helpful. Congrats Snigdha. And with these ingredients, it's good to know that it is controlling the itchiness without any greasiness. Mama Earth is definetly a much trusted brand for baby and mama's..would suggest this to my sister who is in her 3rd month of pregnancy. My cousin sister is expecting soon and has sever dry skin issues. I am going to share this essential body oil with her. Seems to be a very nice product. Thanks for sharing the detailed ingredients list and review . I believe that the belly stretch marks are like an insignia of a beautiful time I had when I was carrying my baby so inwouI never use any oil to get rid of that but I am sure plagued because if the stretch marks on my shoulder blades! So I am gonna try it. Congratulations on your second pregnancy. It truly is a blessing. I love using oils on my body and they are so nourishing. My sister is pregnant and is in her 2nd trimester. I will recommend this oil to her. I have used this body oil this entire winter and will be ordering another bottle. Its so amazing on my dry skin. 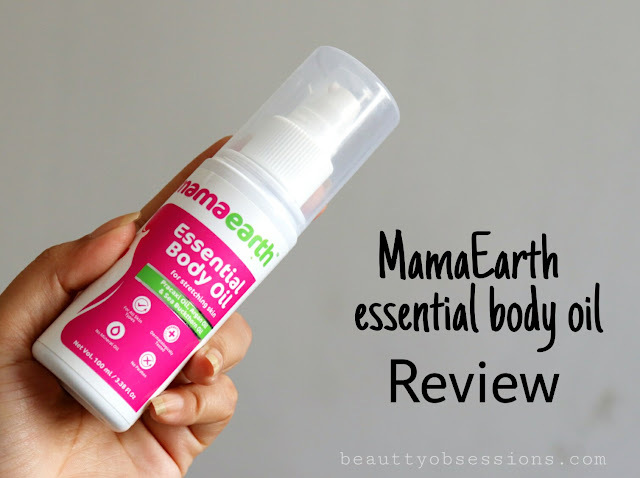 I love using body oils and mamaearth is a really trusted brand! Since it reduces dryness and keeps the skin supple, i will try it! 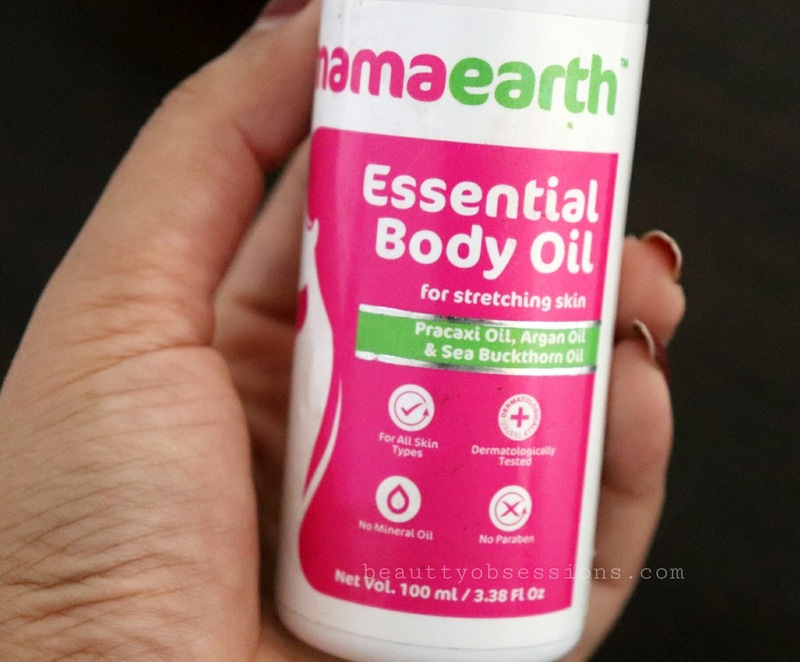 Mama Earth body oil has some nice essential oils indeed. Would love to try this brand this winter. That was a brief review. Mama Earth is really amazing brand. I would love to try this sometime. Very well written and detailed review. I know what you mean about oil being well too oily and staining clothes and all - this is the one reason i too stay away from using oil. Good to know about this product which is effective and light.